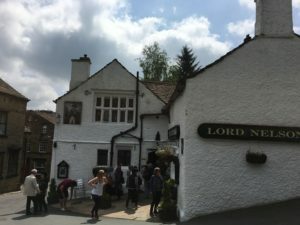 At the very heart of the village, adjacent to St Mary’s Church, is the award winning Lord Nelson: a friendly and inviting 17th Century coaching house with beautiful, if hidden, garden for the summer and cosy fires in the winter. The 1634 datestone over the door of the pub recalls its origin as a private house. It did not become an alehouse until the middle of the 18th century when it was called the White Swan. The pub was a favourite of Bramwell Bronte, the only brother of Charlotte, Emily and Anne, during his time as as a clerk on the Leeds and Manchester Railway in charge of Luddenden Foot Station.